They mentioned to me on my first day that as part of employee appreciation week, there'd be a potluck in the break room this weekend. 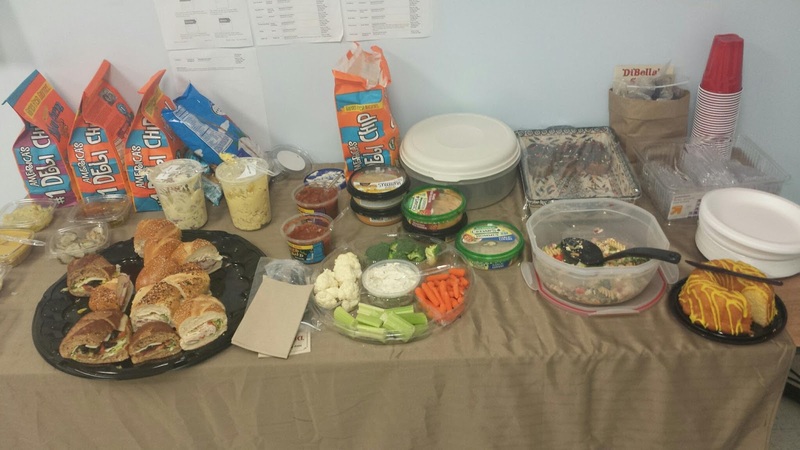 When I looked at the sign-up sheet I mistakenly read that it would be on Friday and Saturday, so imagine what a pleasant surprise it was to walk in for my shift today and see this table full of free food. First the extra discount, and now FREE FOOD! Looks like I joined the team during quite the lucky week. I helped myself to two mini sub sandwiches, and two of the most scrumptious cupcake I've ever had in my life! 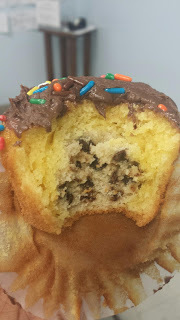 One of the girls made cupcakes with yellow cake, chocolate icing, and chocolate chip cookie dough in the center. Cookie dough inside of a cupcake, y'all! I'd never even heard of anything like that before! It was too good, I tell you. Too. Good. What a nice way to cap off my first week on the job.